3 Responses to "The era of the button"
You got a button maker!!! Fun. Your knit buttons are so awesome!! are they made with real fabric? how do you print on them?? ooooh… you could totally use fabric, then print on transparency and use that instead of mylar. 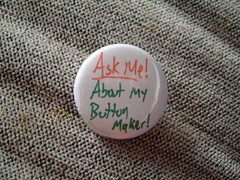 For some reason I feel a strange, unyielding urge to ask you about your button maker. Hmm…I wonder why that would be? But, all joking aside, I have a question for you. I just bought a button machine myself at the website I provided in the comment form and I\’m wondering what font you used to make your button. It kind of looks handwritten, but I like the style…so if I can duplicate it I\’d like to. If you just wrote it by hand, I guess I\’ll just try that myself. Have you found any good websites our resources that offer button making tutorials or templates? Thanks for any info.